When I started the design process of our kitchen I didn’t quite know the direction I wanted to take. 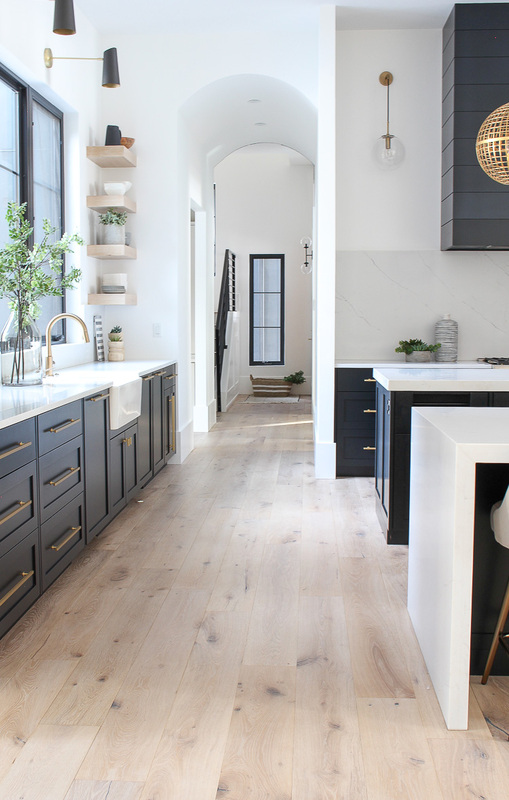 I would spend hours and hours looking for inspiration photos on Pinterest and Instagram in hopes to spark my own creative design for our dream kitchen. 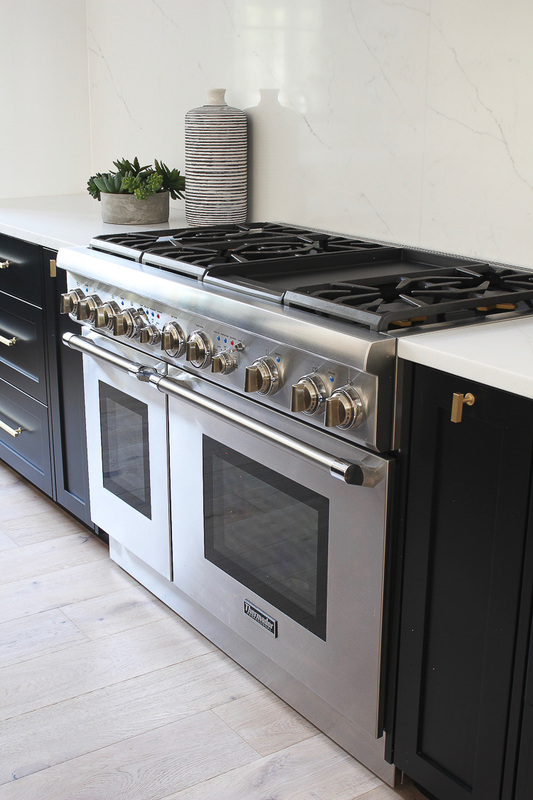 I learned a lot through the process and hope that this Kitchen Q & A will help guide you and give you inspiration if you are building or renovating your own kitchen. I’ll address the most common questions I receive. Affiliate links used. See full disclosure and photo policies HERE. Before we dive into the Q & A, let me explain the process of our kitchen design. I did not enlist the help of a professional kitchen designer. I’m sure that would have made this process so much easier but I really wanted to accomplish this on my own. I worked with a local “old school” cabinet maker who has a small crew of talented guys building cabinets out of a small shop. The only kitchen concepts we had to work with were basic drawings I would provide him with measurements. No fancy 3d renderings. I had to rely on my own vision within my mind and hope the outcome would ultimately be my dream kitchen. This is one of the basic renderings from my cabinet builder. For those who have been curious about dimensions of our floating shelves, here you go! This sketch turned out looking like this in our new kitchen. Sure, the computerized 3d renderings would have looked prettier than my chicken scratch but the outcome still turned out the same. I relied on my own tape measure to lay out the kitchen and determine the size of each and every cabinet and drawer. What I found to be really helpful was to look at our current kitchen at the time (see our previous kitchen HERE) and take note of what worked and what didn’t work as a functional kitchen in that design. I measured all of our drawers and made modifications off of those dimensions to fit our new kitchen. I planned out where every single dish, utensil, cooking gadget, dish towels, etc. would go. Everything would have a designated spot in our new kitchen and would be planned out before the cabinets were even built. I knew that having two dishwashers worked well for us so I planned for that again. That’s one thing I always recommend if you have the space. If you are like me and don’t like dirty dishes in the sink EVER, then two dishwashers will be your best friend. I also think it’s wise to put your pull out trash/recycle bins close to the sink as well so you can easily scrape food off of plates before rinsing off. Since we have no upper cabinets, I had to be smart about how we would store our daily dishes. 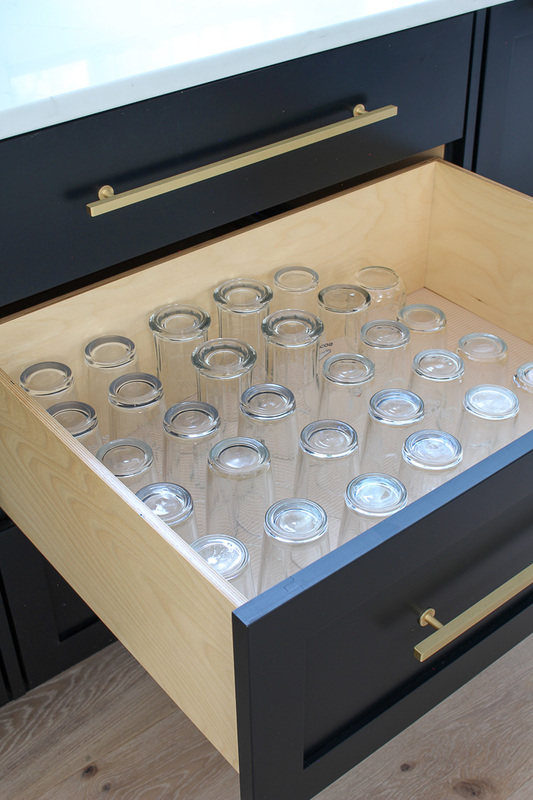 Drinking glasses are all in this deep drawer. I love this concept more than reaching for them in a cabinet actually. Just my personal preference. Coffee mugs are stored in a separate drawer in our pantry just below our built in coffee maker. You can see more of our Butler’s Pantry HERE. 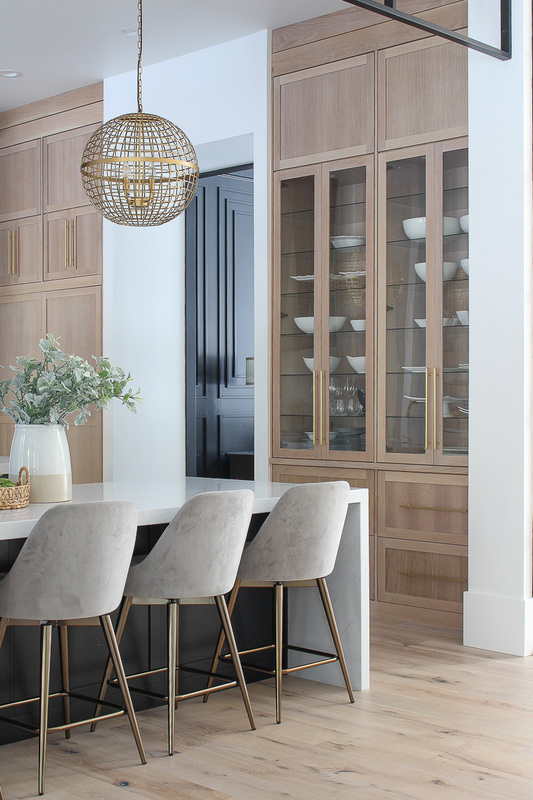 My best kitchen design tip if you are working on a kitchen design, is to take stock of everything that will be stored in your drawers and cabinets. 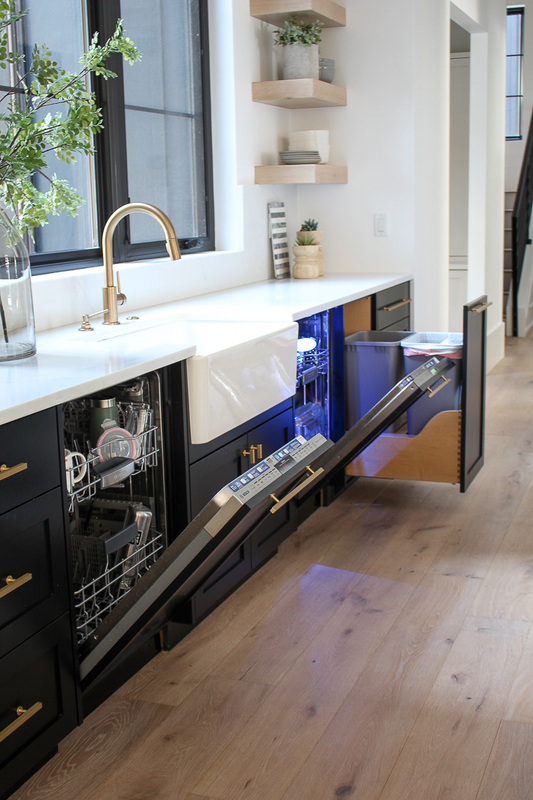 Take note of all your essential inventory and plan out where those items will go as you design your cabinet and drawer layout. 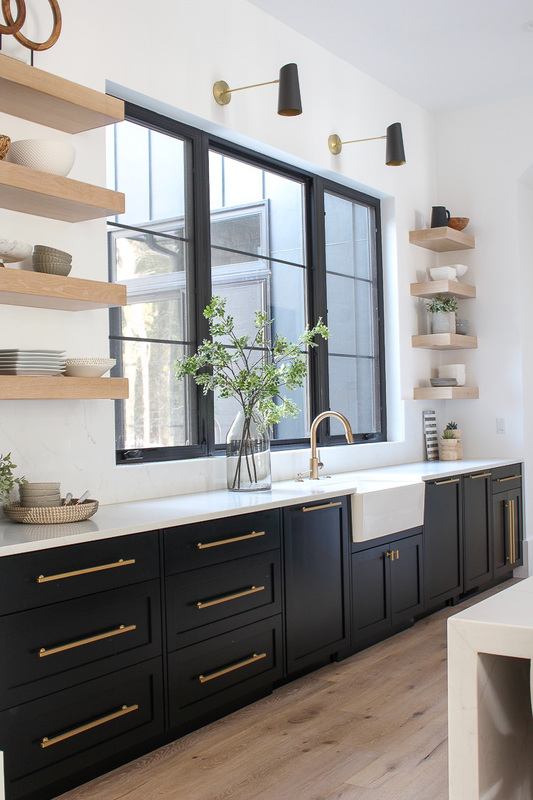 If you are going with the open shelf concept and minimizing or eliminating upper cabinets, this may be the time to purchase those eye appealing daily dishes (bowls, beverage glasses, dinner plates, etc). Open shelving is definitely not for all the mismatched hand me down dishes or plastic sippy cups. Put those items in drawers. 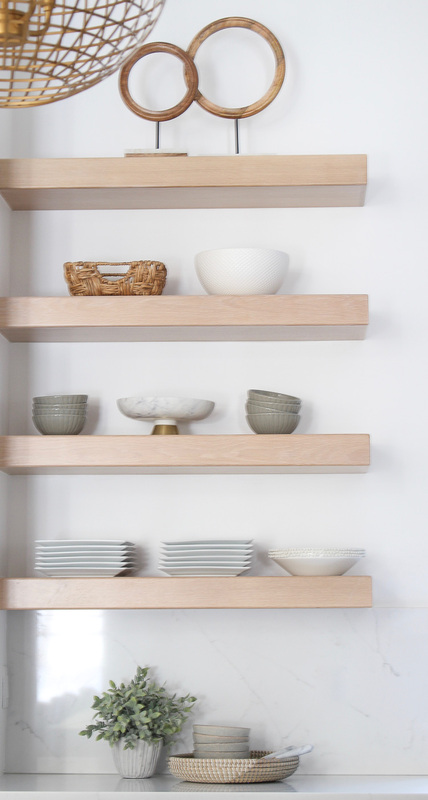 The idea is for your shelves to look like a pretty display yet be fully functional and stocked with dishes you will use daily. Let’s go ahead and dive into the Q & A. 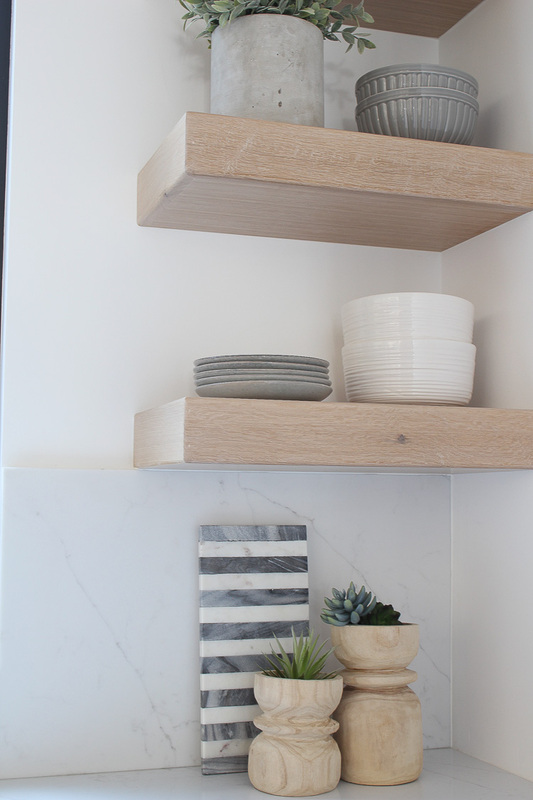 Our floating shelves is one of the most popular questions. Our shelves are made out of white oak. “Plain sawn oak” to be exact. The reason I state that is because we used a different cut oak, rift sawn white oak, for our cabinet and drawer panels. I’ll explain why we did that in a minute when we look at that part of the kitchen. Basically though, plain sawn oak is the most affordable and for shelving it made sense. They are 3 1/2″ thick. They are super strong and can hold a lot of weight since our cabinet maker installed support brackets directly into the 2 x 4 studs before drywall was installed. The shelves were made box style with a hollow opening in the back that would allow the shelf to slide onto the support brackets. 24 x 17 ft with 12 ft ceilings. What are the dimensions of the two islands and spacing between islands and perimeter cabinets? The pathway between the kitchen window and two islands is 5 ft. Since it’s the pathway we walk through to get to the garage, laundry room, etc. it needed to be wide enough to easily pass by when the dishwasher doors were open. From the perimeter cabinets on the range wall to the island is 4 ft.
42″ is between the two islands. You’ll notice that I went with a low profile backless counter stool to tuck under the island. I love how we have the additional seating option yet the stools don’t interfere with the space. What are the dimensions of your islands? The island with seating is 48″ x 10 ft and seats 10 people comfortably. The prep island is 44″ x 10 ft. My original kitchen plans had one huge island. I wised up right at the final moment and made the decision to make two islands. So much more functional for a large kitchen. 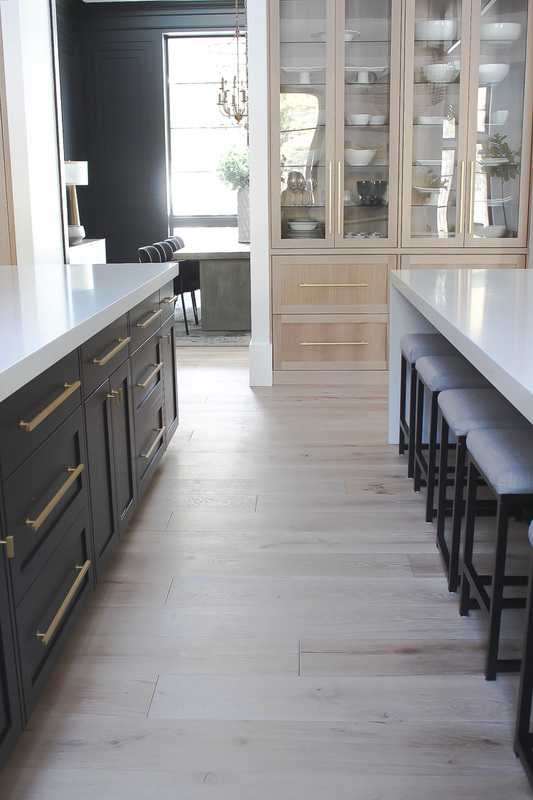 By dividing one massive island into two functional islands I gained more cabinet storage, more seating and resolved the dilemma in having a large seam run down my countertop in our quartz. Speaking of countertops, next question. 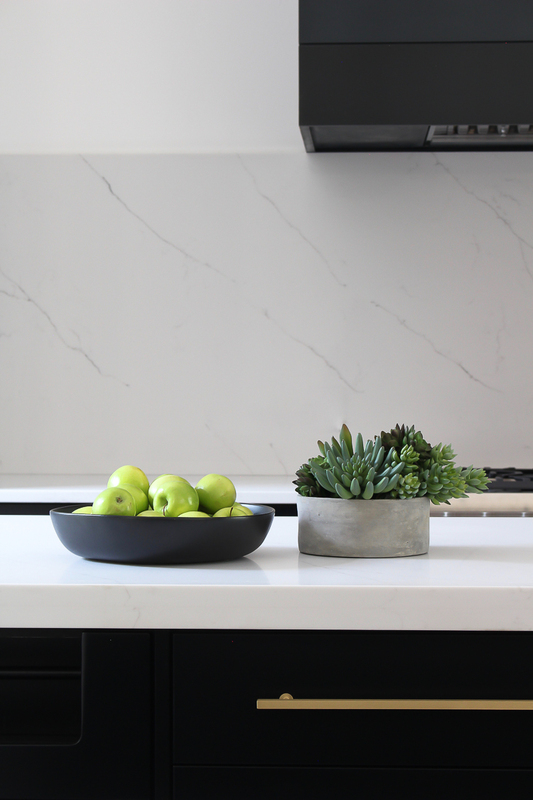 What material are your countertops and why did you go with that particular stone? Quartz. Color is Paragon by Aurea Stone. 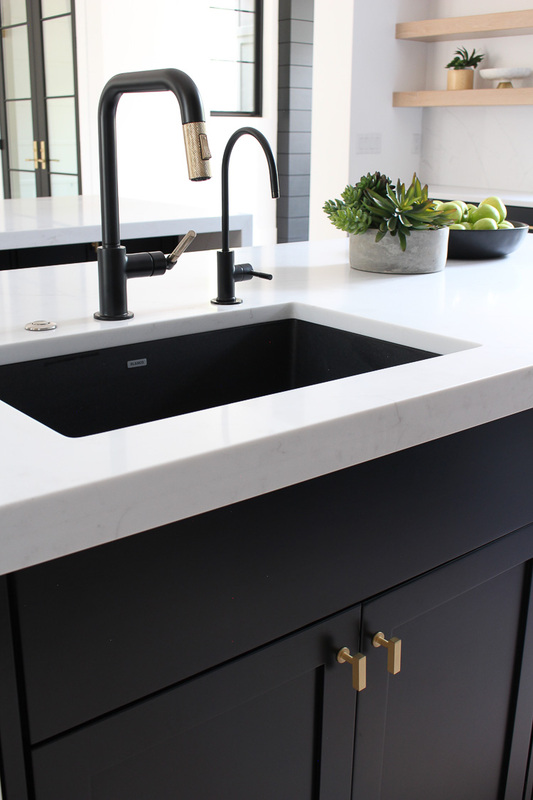 I’m a big fan of quartz because of its low maintenance and durability. We’ve had it in 3 homes now (previous Kitchen HERE, and beach cottage kitchen HERE). This particular quartz looks the most like natural marble in my opinion with the faint veining. 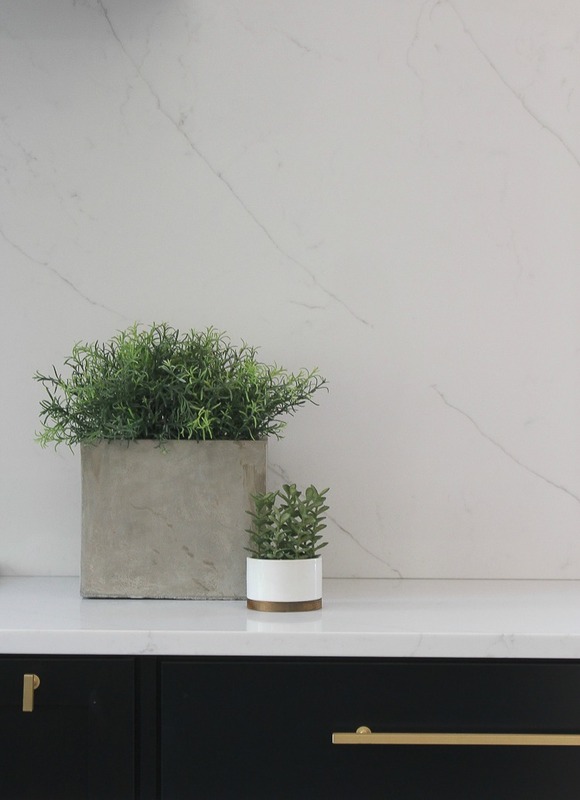 What I love about quartz is that it doesn’t etch or stain like marble does. I call it “bullet proof” and for me that is super important. It shines up beautifully and doesn’t show signs of wear and tear. The perimeter cabinet countertops are standard 3 cm thick. The backsplash is 2 cm thick which is more cost effective and less weight to glue to the wall. 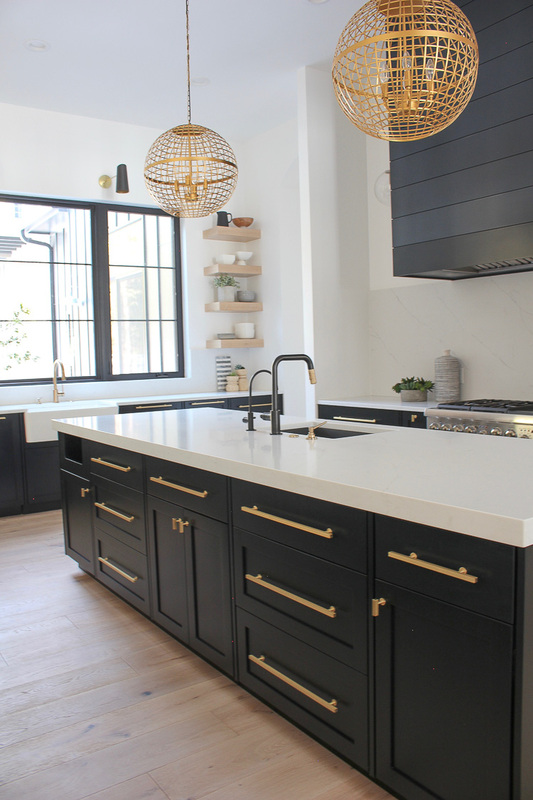 I love the look of a “thicker” countertop, but that certainly drives up the cost. Our two islands, however, are 6 cm thick with a mitered laminate edge (that’s the process done to get the look of a double thickness slab). 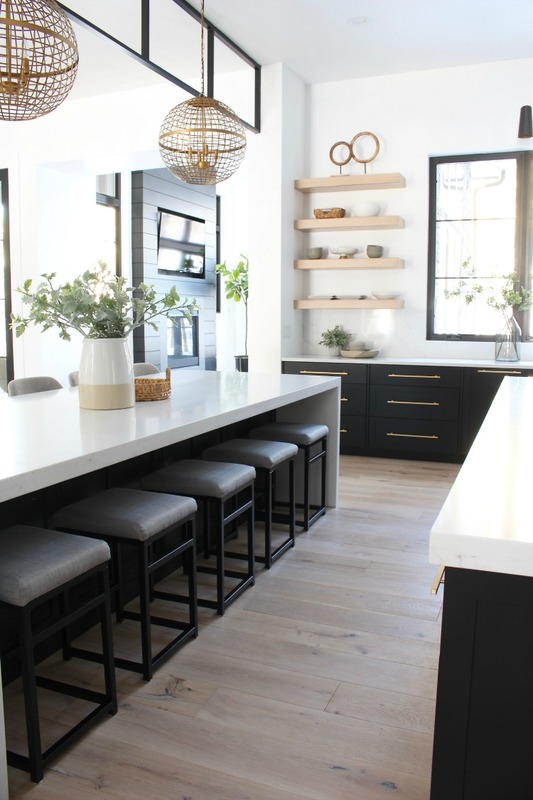 If you have the space to do two islands in your kitchen, I like to see them be different from each other. 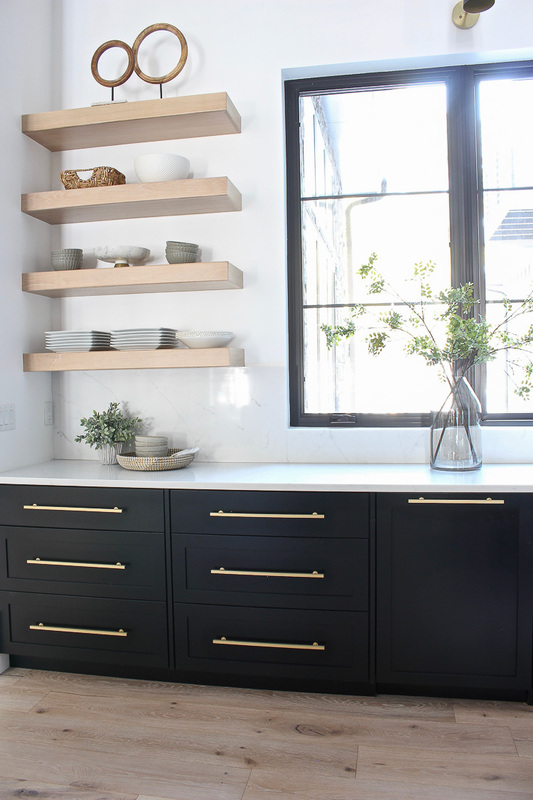 I love the look of a waterfall edge (when the countertop material runs down the side of the cabinetry). I’m happy that I was able to incorporate that look on one of our islands. 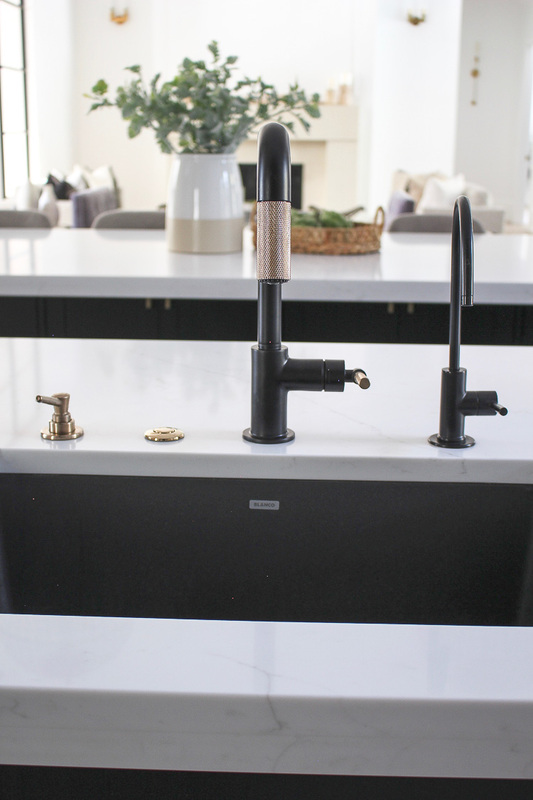 Since that island is mainly for eating meals on and not for prepping or preparing food, we didn’t need electrical outlets that you would normally have on the sides of an island. 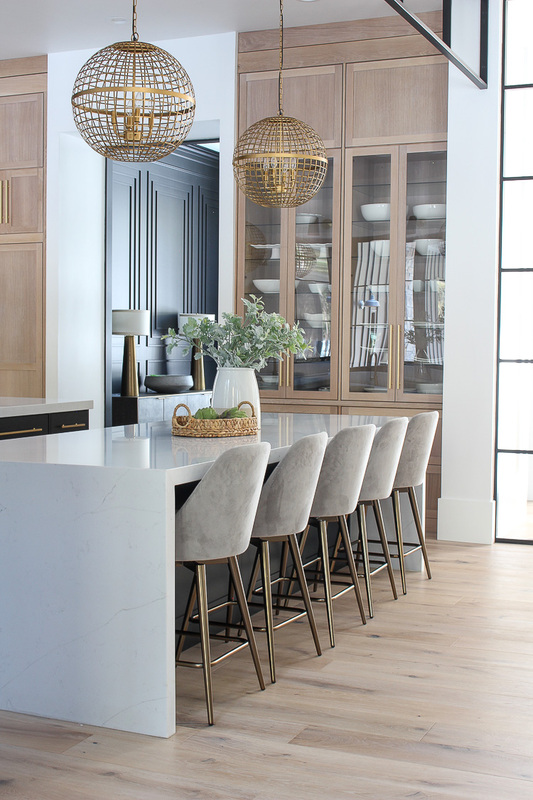 You’ll notice that we do have a row of cabinetry beneath the island which is approximately 12″ deep allowing an 18″ overhang on both sides of the island for seating. One thing to note though, we do have hidden steel support bars below the quartz to reinforce it with the 18″ overhang on both sides. I get asked that question a lot on how much overhang is “safe” in quartz without risk of it cracking. I’m not a professional on the matter but just stating how our countertop installer made ours structurally stable. 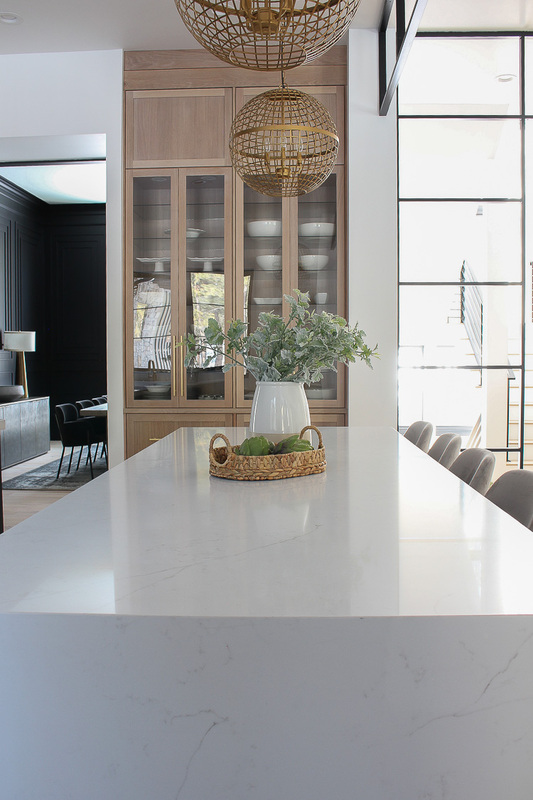 Another reason why we chose this particular brand of quartz is because it comes in jumbo size slabs (126″ x 63″) which is important if you have a large island. With ours being 10 ft, we were able to avoid a seam on the island countertops. 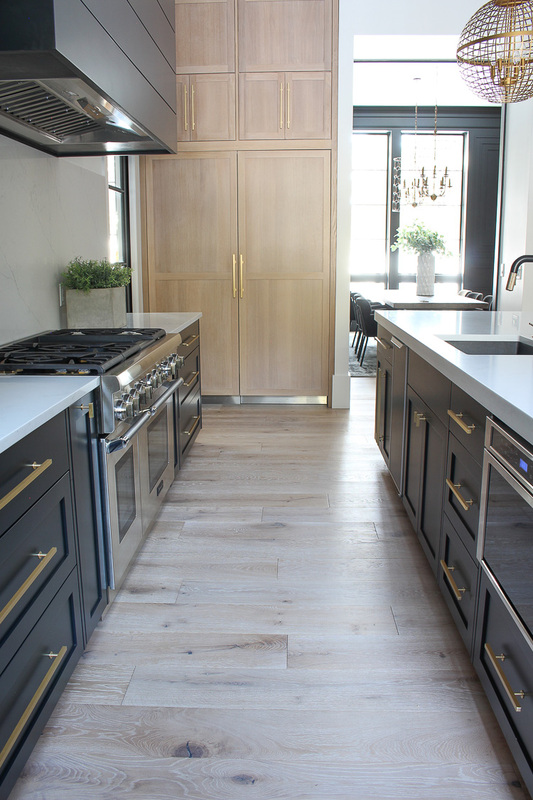 Why did you choose rift sawn white oak vs. plain sawn for your cabinet panels and drawer fronts? The difference is in how the wood is cut from the oak log which ultimately affects the grain pattern you see. Rift sawn oak cuts produce a linear grain as opposed to the “cathedral” patterns you commonly see in plain sawn oak. The process of getting the rift sawn cuts is more technical which means more expensive. I feel like the long linear grain lines of the rift sawn oak appear more contemporary and achieved the exact look I was going for. 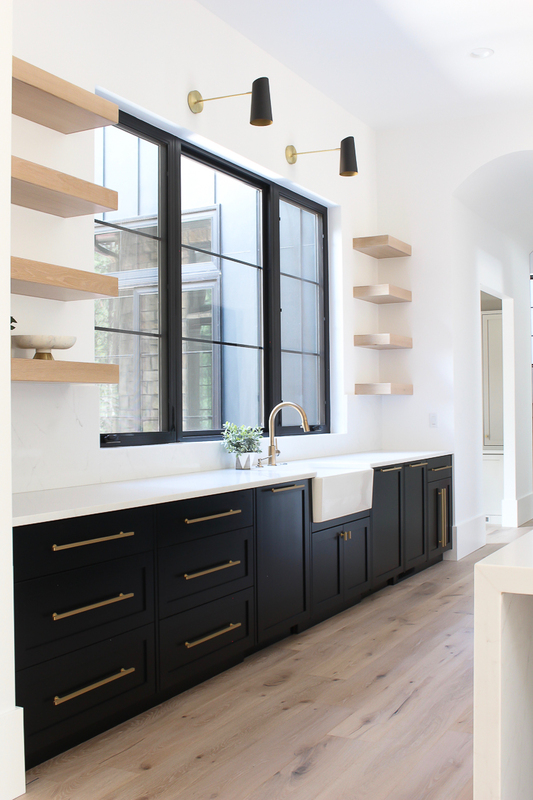 Since we mixed black cabinetry with the natural oak cabinets, I was able to achieve the look I wanted without breaking the bank on an entire kitchen of rift sawn oak. 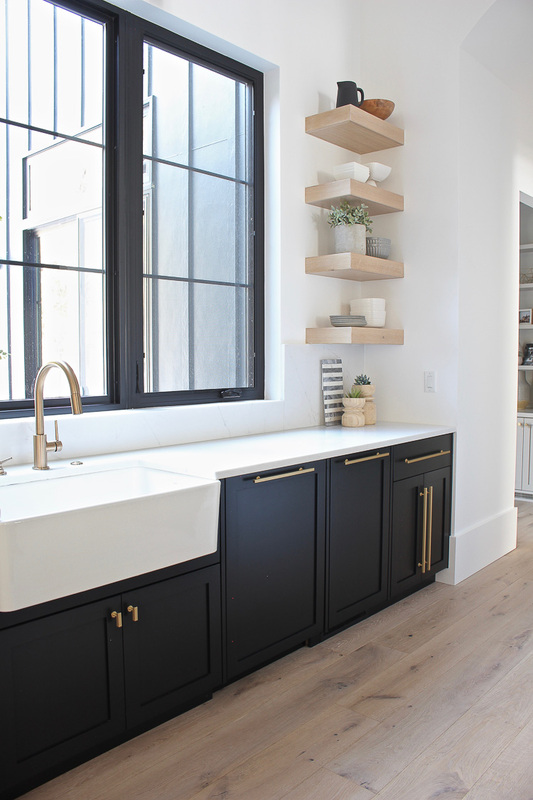 How did you achieve the natural stain look on your cabinets without the oak getting a yellow undertone? THE MOST ASKED QUESTION, EVERY SINGLE DAY. I know what you all are talking about when you say “yellow undertone.” That’s the nature of raw wood to darken when a stain or lacquer is applied, even if it’s a clear matte finish. I absolutely did not want my cabinet panels to read “yellow” after they were stained. The raw oak is naturally so beautiful where you just don’t want to touch it with chemicals but obviously need to, especially in a kitchen where the wood needs to be protected. I wish I had an easy answer for you on how my cabinet maker and I figured out the formula. It was through trial and error. The clear stain that he applied to the first sample board obviously had a yellow undertone. We decided to add a little bit of white paint for an almost “white wash” or lime wash effect to break that yellow undertone. After about 5-10 sample trials, we figured out the magic formula which was just a teeny tiny hint of white paint added to the clear stain mix. The result is beautiful and a true natural looking oak. No yellow or even orange undertones. Photography is even hard to capture the true “color” but if you saw them in person, you’d probably think they weren’t even treated with a clear stain. They are so natural looking and exactly the look I wanted. Are those functional cabinets on the very top? Yes. The top panels above the refrigerator/freezer and above the glass built ins are functional cabinets. The doors are on a pop up hinge. Great bonus storage for items I rarely use. Actually, I don’t have anything stored in them currently. I kept the hardware off so they looked less like cabinets and more like custom millwork. Do your glass cabinets have lights? Yes. Instead of doing wood shelves inside the cabinets I chose to do glass shelves so the light could fill the whole cabinet unit. In our previous kitchen, we had open shelves with lights but the light illumination seemed to stop at the first row of shelves because they were wood (you can see those open shelves in our previous kitchen HERE). The lower shelves didn’t get the same lighting affect and that always bothered me. How would you describe your style of cabinets and drawer fronts? Most of our drawer fronts are shaker style with the exception of some of the black cabinet top drawers being a flat panel. The reason I eliminated the shaker panels on the top drawers is because they are smaller and I didn’t want the drawers to appear too “busy” if that makes sense. Plus I like to break up cabinet fronts for a more custom look. We have inset cabinets which means the doors and drawers fit inside the cabinet face frame opening. This design gives a more modern, streamlined look with the flush inset doors. What is the length of your cabinet hardware pulls? Where can I get your cabinet hardware? The majority of our cabinet hardware pulls are 18″ but I do have some that are 14″ (on dishwashers) and 10″ on smaller drawers. I love having one large pull as opposed to two smaller pulls on a drawer front. Our cabinet hardware is my absolute favorite! We first put it in our beach cottage kitchen (HERE) and master bathroom (HERE) a few years ago and are so impressed with the quality. They are strong and solid. Don’t feel hollow like some hardware does. The matte gold finish has never scratched or lost its luster. I highly recommend this brand of hardware. You can find our specific drawer pulls HERE. Personal preference. We had a pot filler in our previous home and I think I used it one time in the 8 years we lived there. I don’t even know why I didn’t use it. I just wanted the clean look of our quartz backsplash and didn’t feel the need for the additional expense. We have a prep sink in the island which is just as easy to fill pots with water. You’ll notice that I also went with a black sink to shake up the design a little. It’s heat resistant made out of a granite composite making it super durable to dump hot pots and pans in. 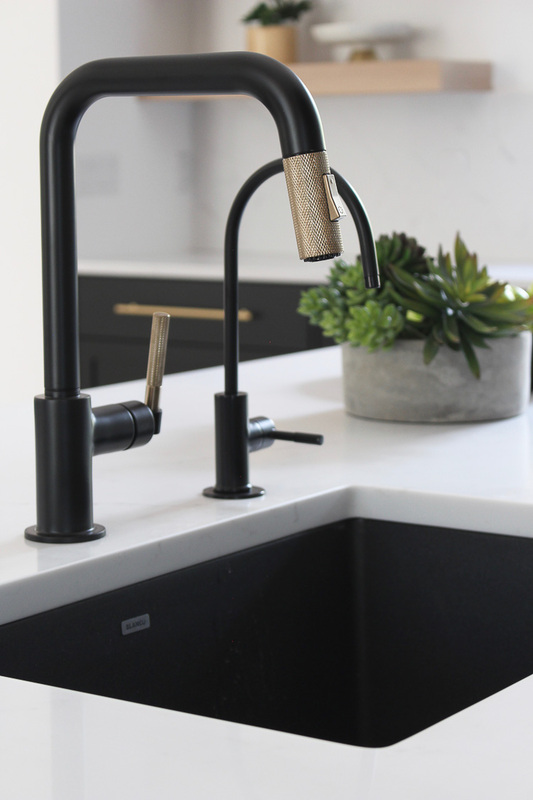 Is your black faucet hard to keep clean and the gold shiny? Not at all! I admit I was a bit hesitant to put such a pretty faucet in my kitchen, especially at the prep sink! It has held up beautifully and I never notice any water spots. That knurled brass is incredible isn’t it?! The smaller water faucet next to it was installed for purified water since our refrigerator doesn’t have that feature. I didn’t realize until after we moved in though that our well water is so pure we don’t even need a water filter. I think eventually down the road, I’ll turn that faucet into an instant hot water tap. Our range hood is MASSIVE. Having 12 ft ceilings, we needed a hood that would make a statement. Especially since we had no upper cabinets to fill the surrounding space. 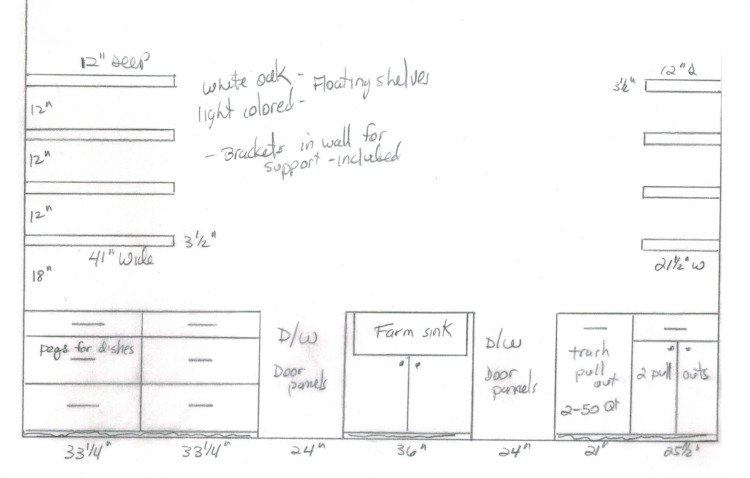 I sketched out a basic shiplap box design and submitted it to my cabinet maker. He built it. The box is 6 ft wide with the shiplap planks being 8″ tall each. 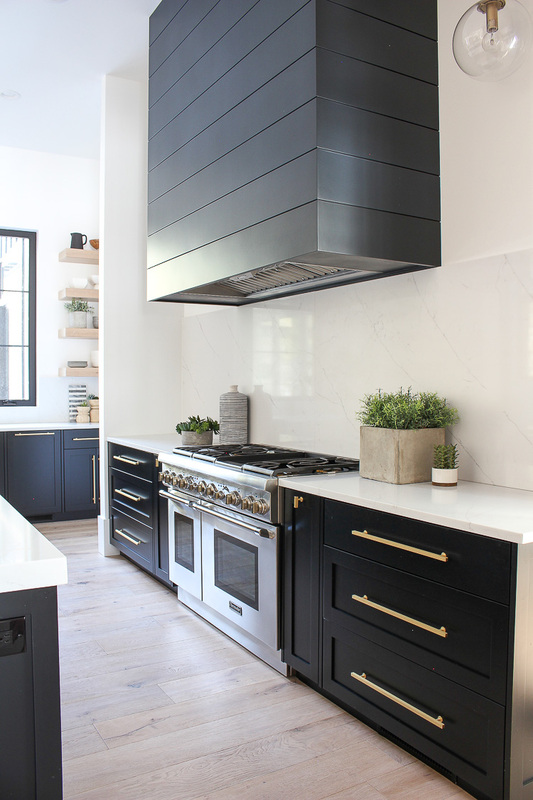 The paint color is the same as our black cabinets, M.L. Campbell Wood Finishing Systems varnish in color 25-17 Black. Is your pantry pocket door made out of steel? Actually, it is not but I’m happy that most people think it is! I had it custom made in wood. Paint color is Tricorn Black by Sherwin Williams. What color of white paint is on your walls? Sherwin Williams Pure White. The same color throughout the home. It’s a bright white that I found to have no undertones in my home with all of our natural lighting. How did you get the steel transom? 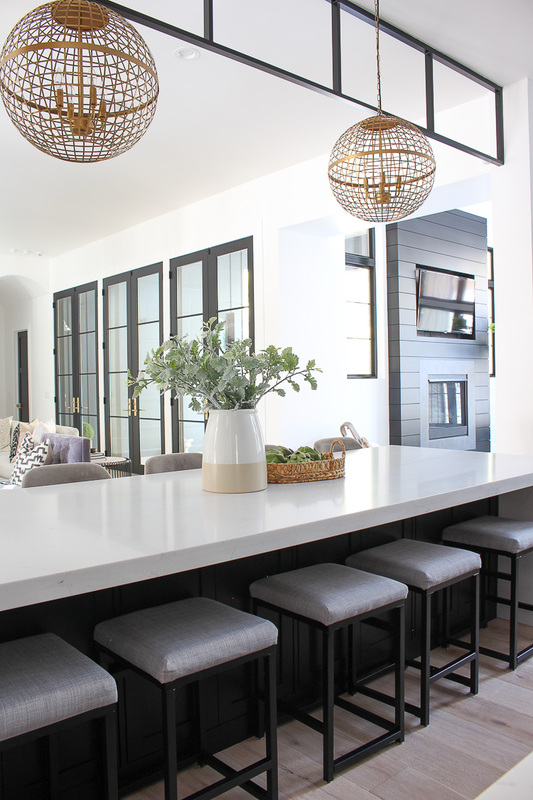 For those who don’t know what a transom is, it’s the metal piece that runs along the ceiling and down the wall that adds architectural interest to the space. I worked with a local metal fabricator to custom design this piece made out of steel. The original plan was to put glass in it but after it was installed, I really liked the open look and didn’t want to deal with cleaning glass all the time. I hope this Kitchen Q & A was helpful and answered all of your questions. All available sources are listed below. 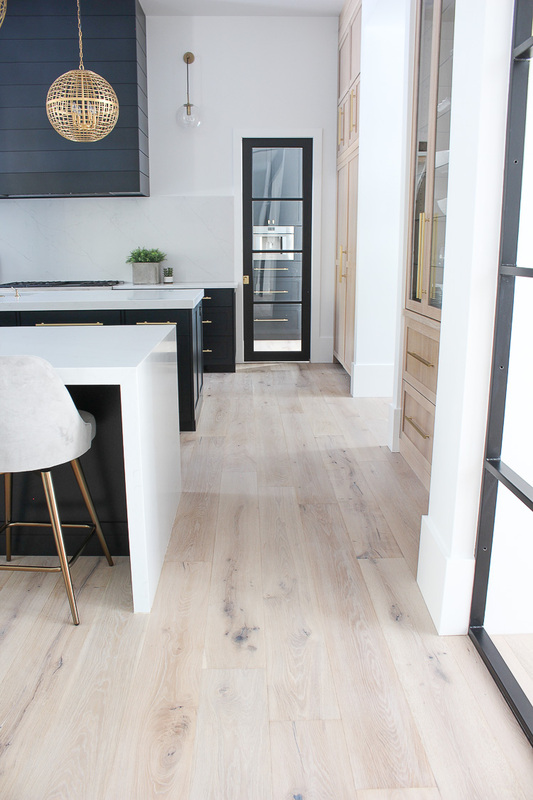 For more information about our white oak hardwood floors, you can read about them HERE. For more information about our black windows, you can read about them HERE. To tour other rooms in our home, you can start HERE. What kind of white paint did you mix in with the stain? And how would you quantify tiny amount? If you can remember. Thank you! I know you’re getting bombarded with questions. Thanks for your patience. Your home is beautiful! Hi Casey, I wish I had a quantifiable solution for you but I really don’t. 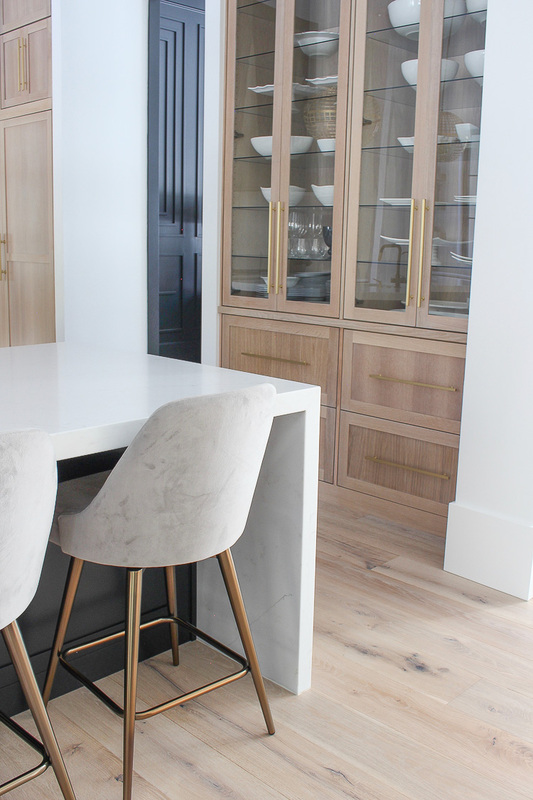 When I customized the stain with my cabinet maker, he added a few drops of white paint to the clear stain at a time but I don’t know what the end result formula truly was. I remember that if we put too much white paint it almost gave a pinkish tint. Definitely trial and error to get it perfect and I think it’s totally based on the look that you want. Hope that helps a little! I am from Cape Town, South Africa and I just want to let you know that your home is OH-SO-BEAUTIFUL! It’s like a dream!!!!! I hope you don’t mind that your home will be my inspiration when we eventually renovate our house., on a much smaller scale of course! Thank you for all the beautiful pictures! Hi Candice! I’m so happy to know my home has inspired someone from so far away! Thank you for dropping a sweet note here. I’m completely flattered that my home will be your inspiration. That is exactly the reason why I blog and share so much of our space. Best of luck in your journey! So much inspiration! Thank you for sharing your home – it is beautiful! I recently moved and as I’m starting to settle in in the new place, I get pulled into many directions with various design ideas but ultimately keep coming back the style you created. I love your restrain, I love the clean lines of all the modern furnishings contrasted with the raw beauty and soft lines of the decorative items. Mixing high-end and affordable. Thanks again for taking the time to photograph, describe and share!! Hi Izabela, thank you so much for leaving a sweet comment. I’m happy to hear that my home has inspired you in your home. Wishing you the best as you venture through your design journey and making your home YOURS. Wow! 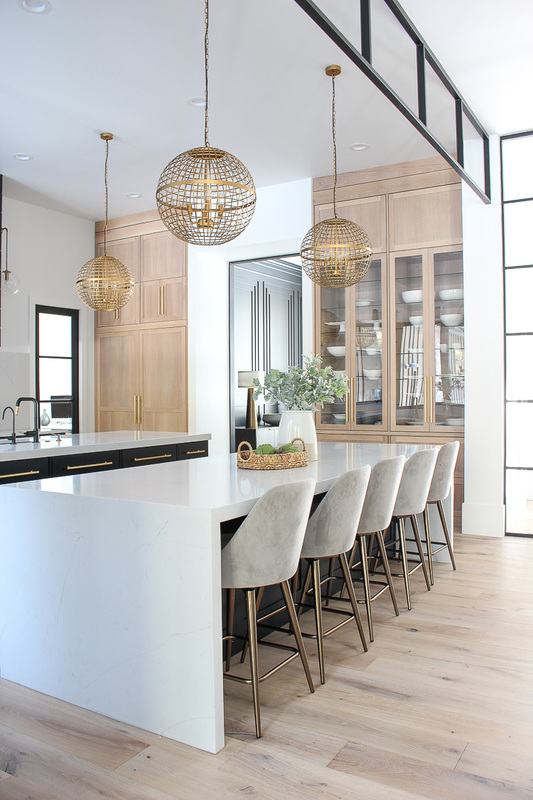 All of your hard work and efforts have paid off – your kitchen is stunning!! Thank you for sharing your thought process on all the details and the beautiful pictures- So inspiring. Thank you Lee! I’m so happy it was an inspiring post for you. You have done an Amazing job in designing your Kitchen and whole house!! I have been watching the whole process of building your home quietly. I loved your idea of doing two islands instead of one. 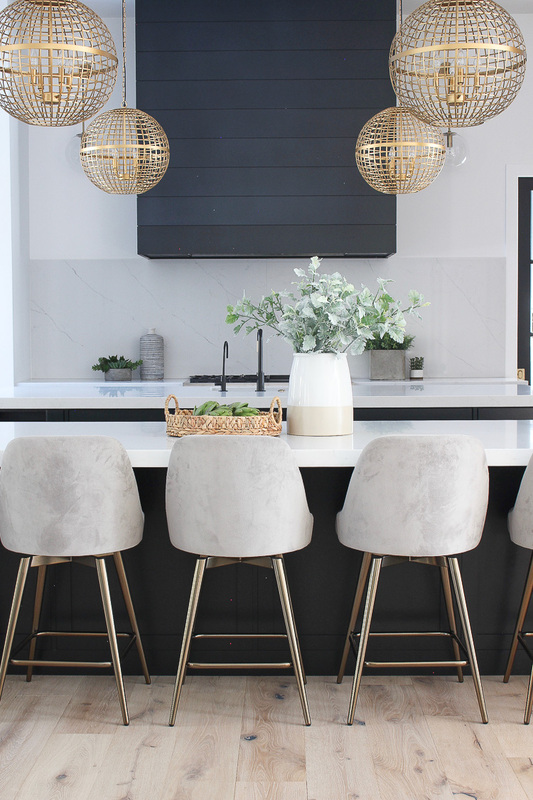 It must be so functional for big parties and hidden stools to give that clean look. 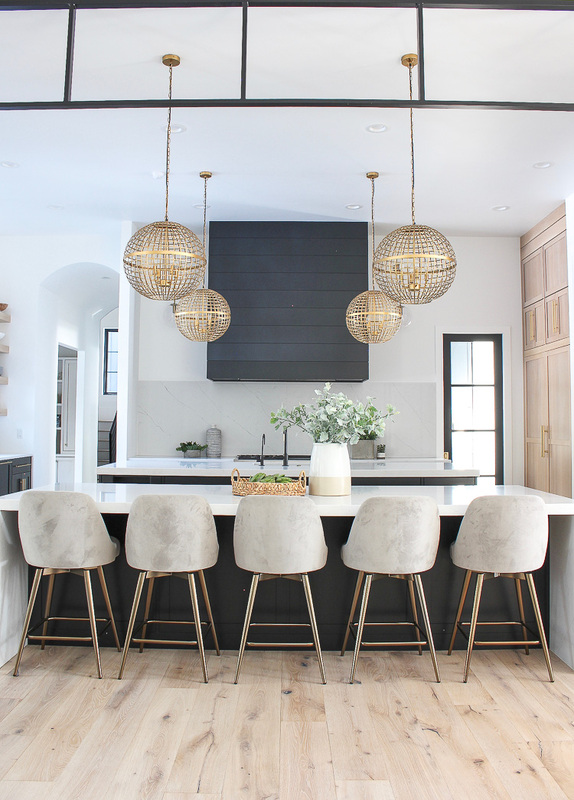 everything is so perfect in your kitchen!!! Hi Smita! I truly appreciate you taking the time to leave a sweet comment here. I love hearing from my readers, especially those who have followed along through the process of building this home. It makes all the hard work, blood, sweat and tears that went into this home more affirming. Thank you for following along! Shauna, it’s all so stunning. Thank you so much for all the detail. When we renovation our kitchen, will definitely use this for inspiration. AMAZING KITCHEN!!! Thank you Denise!! I’m so happy it inspired you for your own kitchen! I’d love to see yours when it’s done! Hi Morgan, thank you for dropping a sweet note here! Maybe that’s why I never used my pot filler either? I’m only 5’3″ and that extra reach wasn’t worth it…lol. Our cabinet lights are installed in the top frame of the cabinet. We put small LED can lights in there and they are on dimmers. Good luck with your projects! You’re welcome, you are deserving! We’re kindred spirits when it comes to Pot Fillers! Lol. I appreciate your response and special thanks for wishing me luck on upcoming projects. (I need it!) I’ve found that trying to renovate the ideas someone else created is even much more difficult than the challenge of building! Stunning! You’ve created a beautiful, functional kitchen. It’s modern, yet the natural wood lends a warmth. You must be very proud of yourself in creating this as a whole. This is stunning! 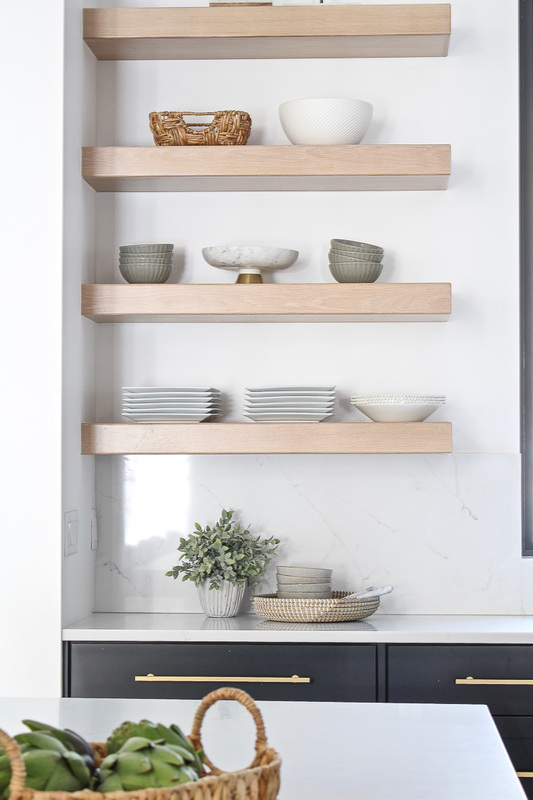 Those floating shelves are the PERFECT shade… I will definitely have to try mixing a small amount of white paint in with stain. 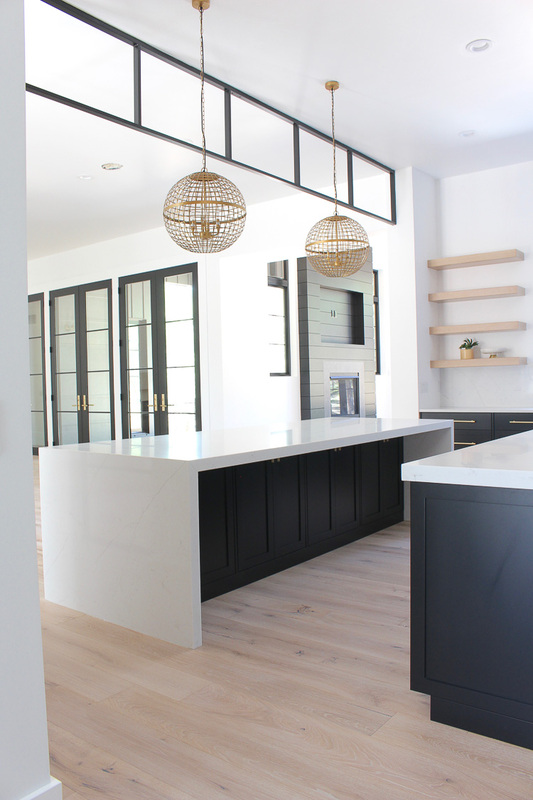 Thank you so much for sharing the great details behind your kitchen design- so inspiring! Hi Shelby, thank you for the sweet comment! I hope you can achieve that perfect wood tone with your stain mix! Your home is just beautiful! I used to live in Colorado Springs and I would love to visit again since I have friends there. I would also be thrilled to get a house tour of your home at the same time. Truly well done! Are you happy with your appliances – especially the refrigerator? Thank you! Yes, we love them. 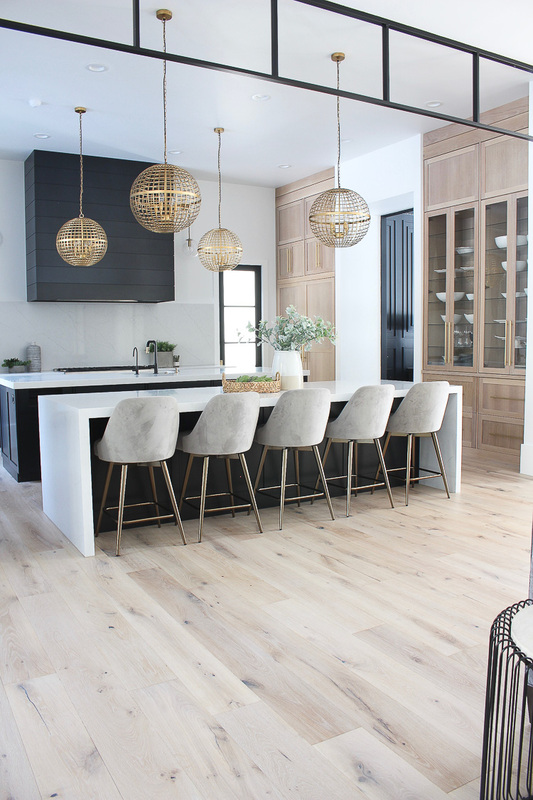 Do you find that with the row of stools furthest from the range is just too far away? Are you shouting to whoever sits there, and do you feel like you have to walk so far just to put a plate down in front of the stools? Not at all! We love the layout and it works great for our family. Thank you so much for sharing your beautiful home!! I have had passion for homes my entire life and would love to see more of the exterior and layout/floor plan you used. Hi Aaron, you may want to check out my home tour page if you haven’t already. You can find it in the menu. Both interior and exterior photos are there. I’ll also be sharing much more this year of different rooms and exterior of our home. Stay tuned. I was wondering if your soap dispenser was the Delta classic soap dispenser in Champagne Bronze…I’m looking for a similar design in an unlacquered polished brass. Thank you Karen! Ours is the Delta dispenser in champagne. Hi Shauna, thank you for sharing your beautiful home with us. Could I inquire who was your stone fabricator and were you happy with the install? Your home is stunning! Did you use regular cabinet pulls or appliance pulls on your refrigerators? I find the appliance pulls so big and bulky! Thank you Mary Ann! I used cabinet pulls. The same as my on my cabinets. They are strong and durable.